Peaceful dog: Versatile Blogger Award! 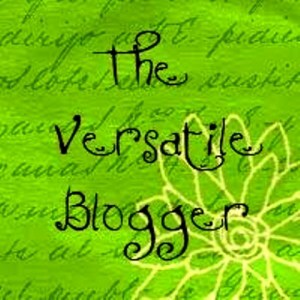 What an honor to receive the Versatile Blogger Award! Thanks to Jen at the fabulous Inu-Baka blog and to Jodi at JodiStone for the recognition. It has been so wonderful to discover this friendly, welcoming community of animal bloggers. I started reading books by the Vietnamese Buddhist Thich Nhat Hanh when I was in college, and have never stopped. I consider him to have been one of my most positive and powerful influences. I grew up in New York City, went to college at Stanford in California, lived in a cave and then worked for the Park Service near Moab, Utah, studied massage therapy in Albuquerque, NM and practiced massage in Taos and Santa Fe, NM, lived in Portland, went to graduate school in Conservation Biology at Columbia University while living with my parents in New York, and then moved to Takoma Park, MD to be near my sister while she adopted my niece Ursula! I never thought I'd stay on the East Coast again but I met the inimitable Florian, my Swiss ballet dancer and sweetie and a dog lover with an incredible sense of humor and a kindred spirit, and have found happiness here that I never encountered in all the bohemian happy hippie-lands I lived in before. Love and a Six Foot Leash. 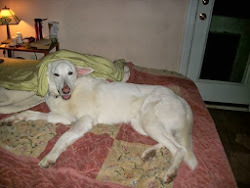 My neighbor Alex writes beautifully about her fabulous foster and resident dogs. Thanks for helping me navigate the blogiverse, Alex! Rescued Insanity. Kristine keeps a wonderfully thoughtful blog including training tips, recipes, and more about her life with the wondrous agility star Shiva. Sustainable Population. This blog is an essential reminder of this most central of sustainability issues. i-Love-A-Bull. 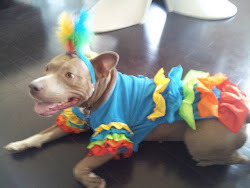 This blog celebrates the pit bull, that most unjustly maligned of breeds, and fights stereotypes with information and activism. Endangered Spaces blog. A vital call to action on environmental matters that need our attention. The Poodle and Dog Blog. 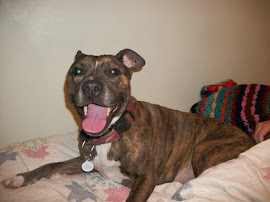 A thoughtful, aware, and very versatile blog on all things dog. 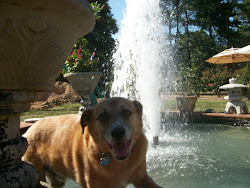 Open Hearts Dog Fostering Blog. Kim blogs on the delights and challenges of having many foster dogs come and go through her doors. Biodiversity in Focus. Stunning photos paying tribute to the wonders of the insect world. Oh, Corbin. 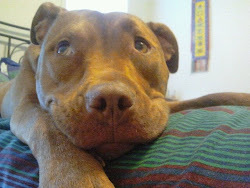 Corbin the pit bull has overcome that little thing about not having opposable thumbs and blogs about all the fabulous foster dogs taken in by his mom. Five Sibes. A blog on five fabulous and furry Siberian Huskies. Success Just Clicks. A progressive, thoughtful positive dog training blog with lots of the nuanced explorations of positive dog training topics that I love! oh my goodness! you are a fascinating person! I got a Thich Nhat Hanh calendar two years ago and I was floored by how moving his words are. hey- thanks for the shout out. you are so kind. i have had so much fun getting to know you through our mutual dog work. i also love watching your blog develop and expand and your network grow. now if we can only get the foz adopted! i am really loving this new format, by the way. Thank you so much for the award! It was so kind of you to think of us. I am so glad Aleksandra introduced me to your blog as I've really enjoyed reading about your experiences. How did you get started playing the mbira? I've seen them before but I didn't know the name. How were you introduced? Thank you ladies! I love reading your blogs too. Jen, I feel instant relaxation when I read him. I really try to incorporate his teachings into my interactions with dogs and their owners. So glad you've experienced him too. Alex, I honestly couldn't have done it without you! You gave me so many great ideas. Jan, I refuse to believe that! 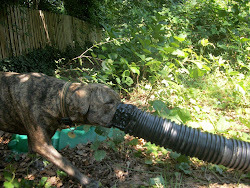 No one who writes about Neuticles and PETA and animal rights and BSL is boring--far from it. Kristine, that's cool you've seen them! I got into mbira ultimately because I took an African dance class in college just for fun, loved it so much that I took another one when I lived in Taos, NM after college, where the teacher was Zimbabwean, and her husband played mbira, and my boyfriend at the time was a drummer and started learning mbira from my teacher's husband, and once I saw him playing it I fell in love immediately and made him teach me! It is an oral tradition so you learn by watching someone--not by reading music. Made it relatively easy to pick up. Thanks for the shout out!! I'm glad you've enjoyed the blog... and humbled that you've enjoyed it enough to pass along this great award. I actually received the versatile blogger award a while back (just realized I didn't add the award to my blog side bar). I wanted to let you know so you dont think I'm ignoring the 7 things and passing it along since i'm not sure I'll post it again. Thank you very much for the award! That was so thoughtful of you! So glad you enjoy our blog. We are now followers of yours and look forward to reading more! Thanks again!! !